When retention of third graders does become a requirement, several exemptions will allow certain below-grade level readers to avoid repeating the third grade. Even so, given that only half of Michigan third-grade students performed at the proficient or advanced levels on last spring’s M-STEP test, many worry about large numbers of children being held back from advancing to fourth grade—especially in high-poverty and urban areas where proficiency rates were lower than elsewhere. Another worry educators have expressed—that children might be retained in third grade multiple times until they are able to pass the state test—were addressed in the law’s final form. Students would not repeat third grade more than once. 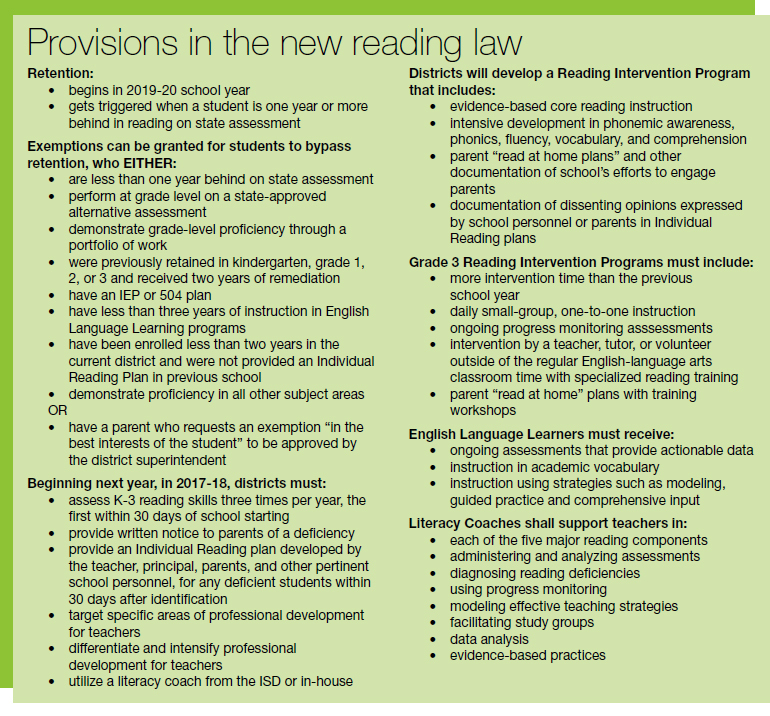 After lawmakers last spring passed competing bills related to third-grade reading, a measure emerged from closed-door negotiations in conference committee in September to pass the House and Senate the next day. One “r” word remained in the final measure that many educational experts didn’t want to mix with the traditional three “R’s”—retention. The new rules do require students who test a year or more behind grade level on the state’s annual reading test to repeat third grade. But there are several exemptions to the retention requirement, along with one major loophole, all explained in the accompanying table. Another important fact to keep in mind: the 2019-20 school year will be the first year that third graders must be retained based on sub-par reading scores. The provisions of the new law that start next school year involve providing extra services to struggling kindergarteners through third graders. Beginning next year, K-3 students must be tested three times a year, and students with reading deficiencies must be given an Individual Reading Plan (IRP). 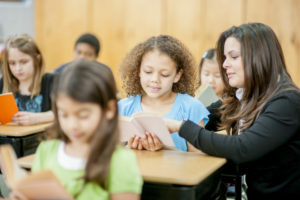 Districts with struggling readers also will be required to provide teachers with additional professional development during school time and literacy coaches who will train, model, and offer feedback on best practices in teaching reading. Services for children also will include increased small group and one-on-one intervention time and “read at home plans” to promote parental involvement. Districts will be encouraged to provide summer reading camps using teachers rated as highly effective. When the third grade reading bill was first introduced three years ago, it would have mandated retention of all students who did not test at third-grade proficiency level in reading with no exceptions, no remediation, and no teacher training included. Intensive lobbying by MEA and other interested groups resulted in significant improvements—although even with those improvements, MEA opposed the final bill. MEA will continue to lobby for changes in provisions of this new law that are not compatible with best practices in teaching early elementary students. The new legislative session beginning in January will provide time to change the first implemented provisions of the law (2017-18) and there will be more than two years to modify the retention provisions before they begin. Although MEA opposed the bill in its final form, our lobbyists will continue to work for full funding of schools and mandated programs. Early next year, training sessions will be offered to MEA members wanting a more detailed explanation of the new law’s mandates.